NASA's lunar orbiter has returned its first pictures of the Apollo moon landing sites. The images — showing the missions' lunar module descent stages accented by their shadows from a low sun angle — may at least prove to die-hard conspiracy theorists that NASA went to considerable lengths to relocate its secret movie studio in the Nevada desert. The Lunar Reconnaissance Orbiter Camera (LROC) was able take pictures of five of the six Apollo sites between July 11 and 15. 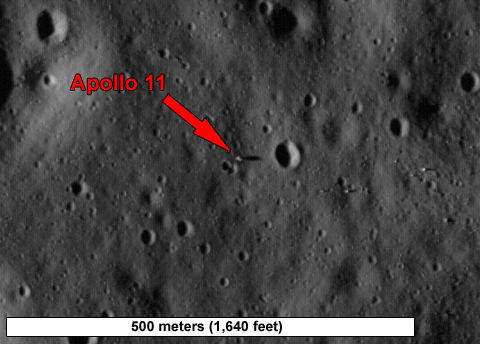 The yet un-depicted Apollo 12 site is expected to be photographed in coming weeks. The initial pictures are somewhat lacking in detail because they were taken before the spacecraft reached its final mapping orbit. NASA says future images of the Apollo sites will have two to three times greater resolution. "The LROC team anxiously awaited each image," said LROC chief investigator Mark Robinson of Arizona State University. "We were very interested in getting our first peek at the lunar module descent stages just for the thrill — and to see how well the cameras had come into focus. Indeed, the images are fantastic and so is the focus." NASA explains that LRO's elliptical orbit made the image resolution for each site slightly different but were all around four feet per pixel. With the deck of the Apollo decent stage at about 12 feet in diameter, they fill a total of about nine pixels. But because the sun was low to the horizon at the time, small variations to the Moon's topography create long shadows, allowing the relics to better stand out. 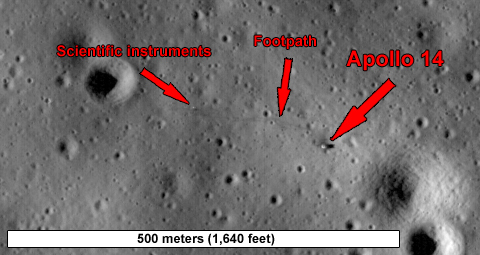 The Apollo 14 landing site had particularly advantageous lighting conditions at the time, allowing details such as the astronaut footpath between the module and instrument package to be visible.